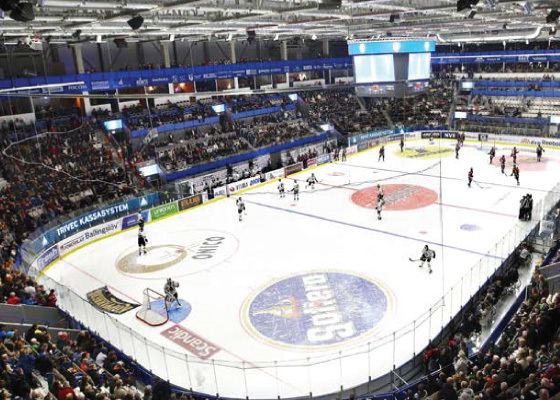 The Arena city – Arenastaden in Växjö has four sporting venues which were built to the highest international standards. This also creates a demand for effective ventilation units that create a comfortable environment for both performers and spectators. This is particularly true for Vida Arena, where the cold from the ice meets the warmth of the stands filled with 6,000 spectators when the puck is dropped. The moisture must not be allowed to settle like a thick, London fog! IV Produkt has delivered all 25 air handling units to Arenastaden i Växjö. For example, the Vida Arena ice hockey arena is ventilated by ten units. Four of these are Flexomix units that do not allow moisture to form when the cold from the ice meets the heat generated by the spectators. Flexomix does not just provide effective ventilation, it also recovers heat from the extract air using rotary heat exchangers. Dehumidification and cooling of indoor air is done using liquid cooling batteries.